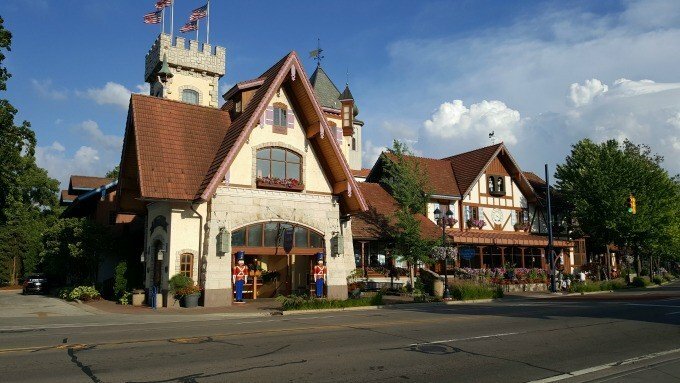 Frankenmuth, Michigan was an easy road trip from my home in North Central Ohio and as I drove into town, I saw a number of attractions that I wanted to stop to visit. I was intrigued by a one-room schoolhouse, the Silent Night Chapel, Bronner’s Christmas Store and the old mill. 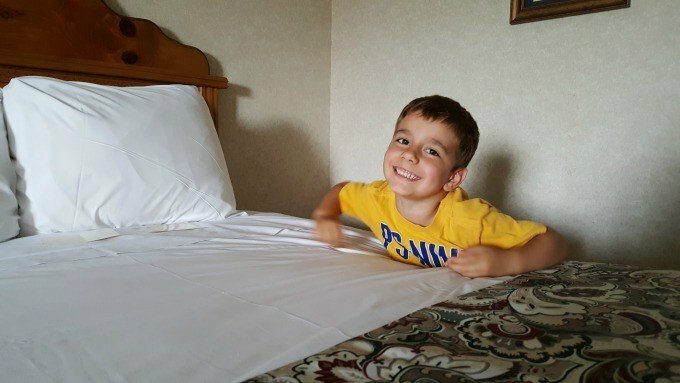 I could not wait to check into the hotel where I’d spend the night with my sister-in-law and five-year-old nephew so we could freshen up and head out to explore. 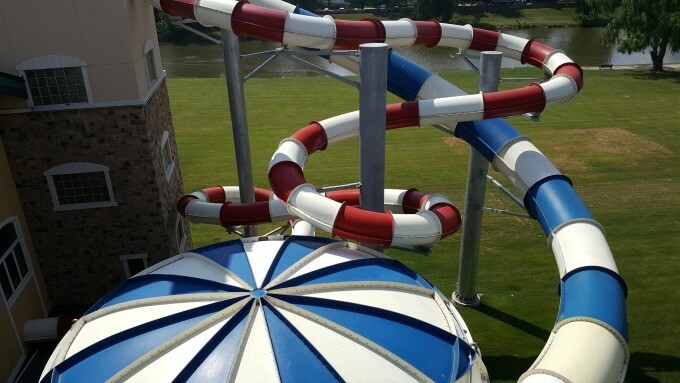 Our home for the evening would be the Bavarian Inn Lodge, a German-themed resort that features an indoor waterpark with four indoor pools, two water slides, and two whirlpools. 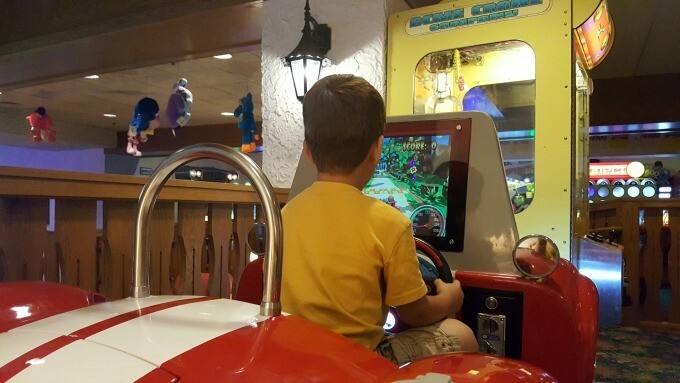 The property also features a family fun center with over 150 arcade games, indoor mini-golf, two restaurants, a lounge and gift shop indoors and peacocks on the grounds outdoors. 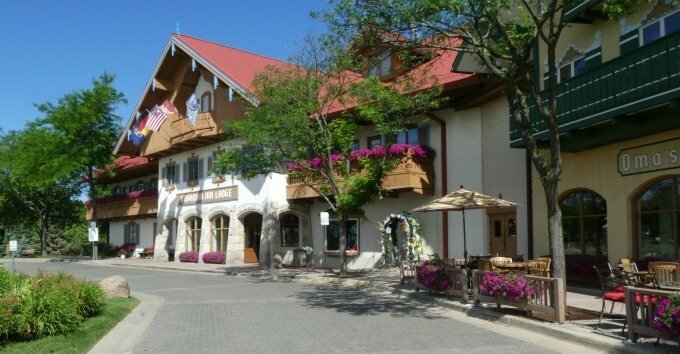 The ideal destination for your family to enjoy a getaway everyone will love is Frankenmuth, Michigan. 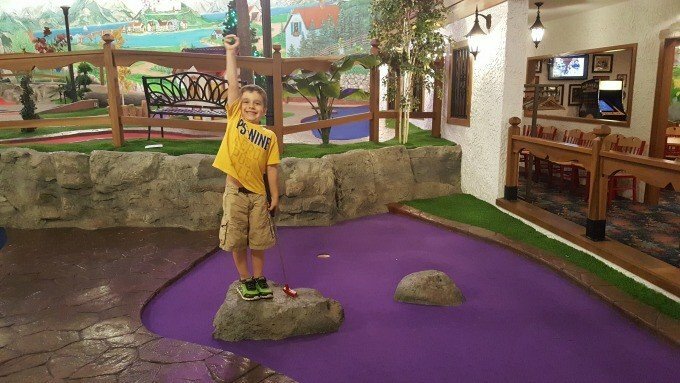 I thought my nephew would be most excited to swim, but it turned out his idea of a great evening was playing mini-golf and as many of the indoor games as possible in the largest family fun center in the Midwest! Since many games cost only a quarter, the $10 I gave him seemed to stretch forever. He went from game to game collecting tickets which he then turned in for a few trinkets to take home. Our room at the Bavarian Inn Lodge was large and comfortable, with an in-room refrigerator and balcony. I stayed up until the wee hours of the morning working at the desk which provided a comfortable work space. We loved our stay at the lodge- from the friendly staff, to clean room, to amazing features, this is one property that I’d definitely stay at again. We spent several hours at the hotel before we made our way back across the covered bridge to the Bavarian Inn Restaurant. Known for their family-style chicken dinners, we were quickly seated and greeted by our waiter with a few slices of homemade white bread and stollen which is a white bread that contains pieces of fruit and nuts. The menu consisted of a mix of American and authentic German meals and the restaurant boasts the largest selection of German beers in Michigan. 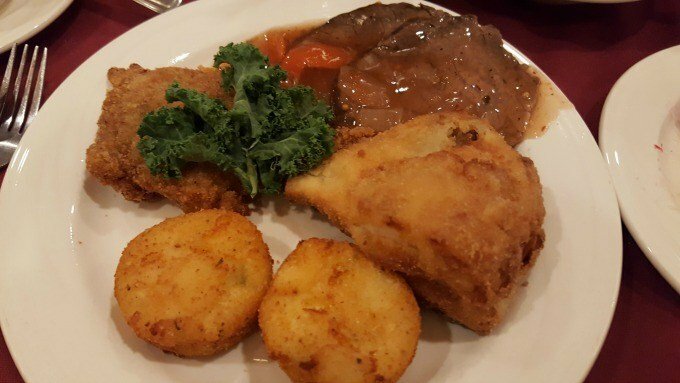 I opted to try the Frankenmuth, a German meal that included several meat options, as well as a plethora of side dishes served family-style. To say there was a lot of food was not an exaggeration, as I was unable to clean my plate and still didn’t have room for dessert. My nephew was a trooper and though he chose macaroni and cheese from the kid’s menu, he also tried some of the grown up selections while happily coloring on his placemat that was provided to keep him occupied. While not gourmet meals, if you’re looking for home-made comfort foods in huge portions in a comfortable setting, this is the stop for you in Frankenmuth, Michigan. The Bavarian Inn Restaurant features several dining areas that include the Bavarian Room with bright pastel colors and another room that featured dark stained wood and dark upholstery and window treatments. Both dining rooms offer booth or table seating options. The restaurant, which opened in 1888 as the Union House, is one of the oldest restaurants in the country. In 1950, the Zehnder family bought the restaurant and continued the tradition of “all you care to eat” family style chicken dinners which have become world famous. 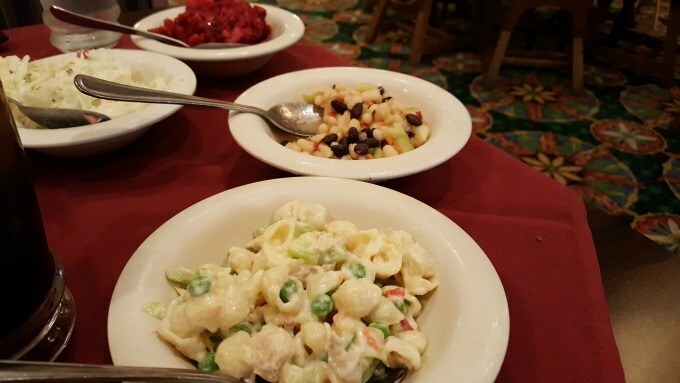 A stop at the Bavarian Inn Restaurant has become a tradition for many families. I was disappointed to realize that we hadn’t arrived in time for the daily pretzel rolling experience, which I’m sure my nephew would have enjoyed. For only $4.99, guests become German bakers and roll their own pretzel and then eat their creation. Tip: When planning your trip to Frankenmuth, Michigan, call ahead to schedule this daily event. After dinner, we strolled along the cobblestone corridors of the castle shops. From candy stores and gift shops, to specialty stores, the Castle Shops are fun to explore and a great spot to find a souvenir or do some shopping. We continued our exploration down Main Street to the cheese shop and taffy shop, taking some time to stop at all the fountains and photo ops available before heading back to the hotel. By this time, we’d walked off some of our meal and my nephew was eager to see the peacocks that are housed on the lawn of the Bavarian Inn Lodge. 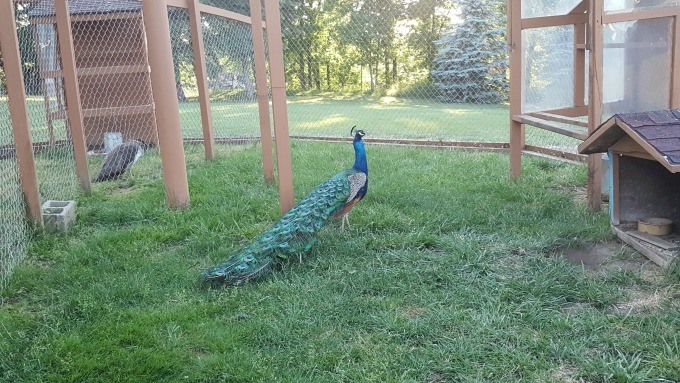 My nephew was fascinated, but the thought of getting some pool time in before bedtime quickly overrode his fascination with the peacocks and we made our way back to our room. 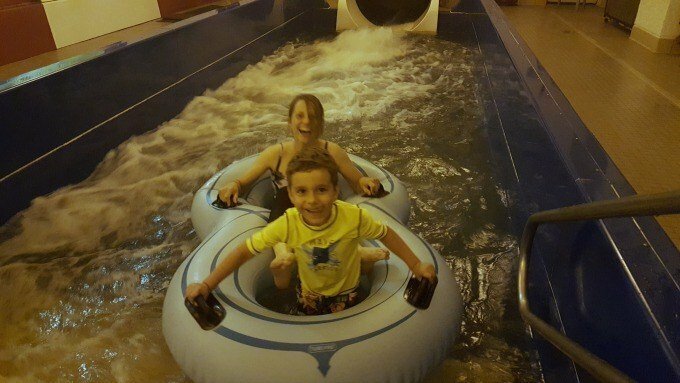 The Bavarian Inn Lodge in Frankenmuth, Michigan, features two water slides and while I didn’t brave either, my sister-in-law and nephew did, claiming it was great fun. I’ll take their word for it. My sister-in-law went down both slides multiple times while I watched my nephew play happily in one of the four pools on property. 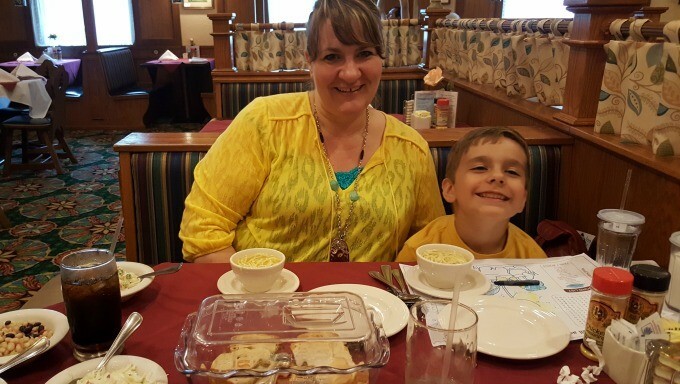 I had a great time exploring Frankenmuth with my sister-in-law and nephew, but couldn’t help but think that Frankenmuth was a destination that my own family would enjoy. My sister-in-law was thinking the same thing and we agreed that it would be a great destination for an extended family trip in the future. Both the Bavarian Lodge Inn and Bavarian Inn Restaurant would be ideal locations for a large party. The lodge offers plenty of seating throughout for groups to sit in public areas and converse, with a range of activities that appeal to a large age range. My parents may enjoy viewing the historic stained glass windows in the conference area and would notice the many pieces of memorabilia from Germany, while the kids’ would love the indoor water park, putt putt golf, and pool tables. I’d enjoy the nearby shopping at the River Shops and proximity to downtown, as one could leave their vehicle parked at the hotel and enjoy a nice stroll across the covered bridge to downtown or along the riverfront. If you’d rather not walk downtown, horse and carriage rides are also available, adding to the charm of this small village. There are a number of activities that range from pretzel making to strudel making to wine tasting and German beer tasting available for groups to enhance your experience in Frankenmuth, Michigan. 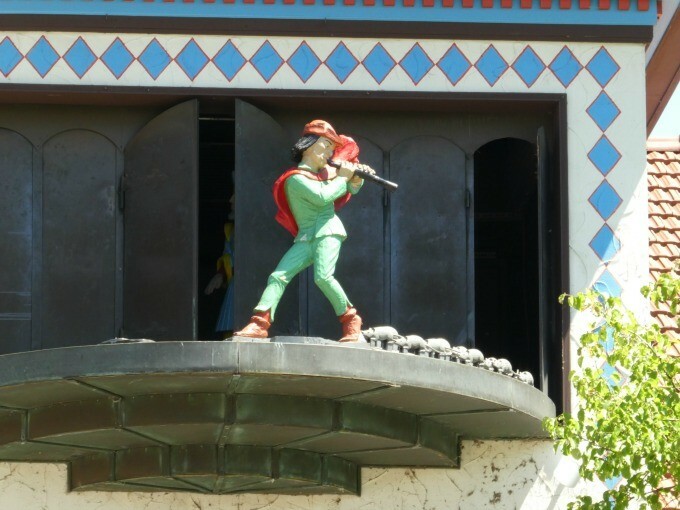 The Glockenspiel Tower outside the restaurant portrays the 13th century story of the Pied Piper of Hamelin several times a day, while the carillon chimes throughout the day on the hour. While I was excited to see the show, I feel I should warn you. The story is bleak and if you have little ones, you may want to read the tale before you choose to watch the show. Dismal tales aside, the tower and figures, carved of wood from Germany’s Black Forest, is truly a marvel worth viewing. There is so much to do at the Bavarian Inn Lodge that you wouldn’t need to leave the property. 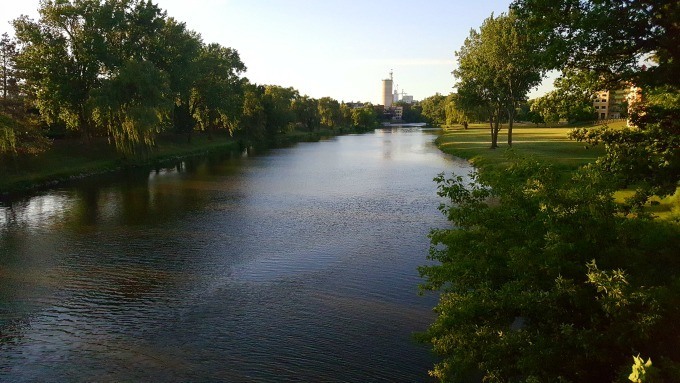 I found a day really wasn’t enough time to begin to explore, but for those with more time here are a few recommendations of things to do in Frankenmuth. Shop at BRONNER’S CHRISTmas WONDERLAND. 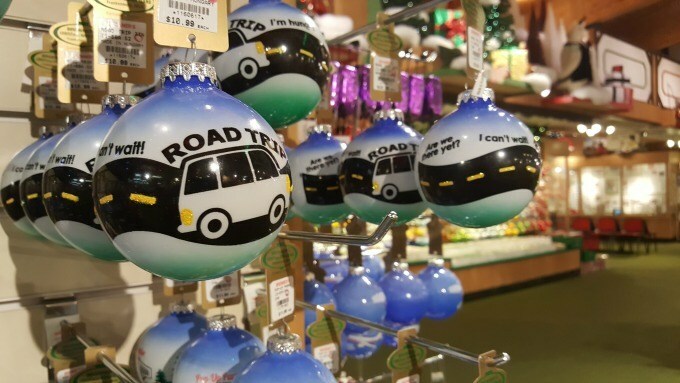 The world’s largest year-round Christmas store, you’ll find every ornament you can imagine and then some. You’ll find decorations from around the world with over 500 styles of Nativity scenes. This is your go-to store for holiday decorating and gift giving ideas. Visit the Silent Night Memorial Chapel. 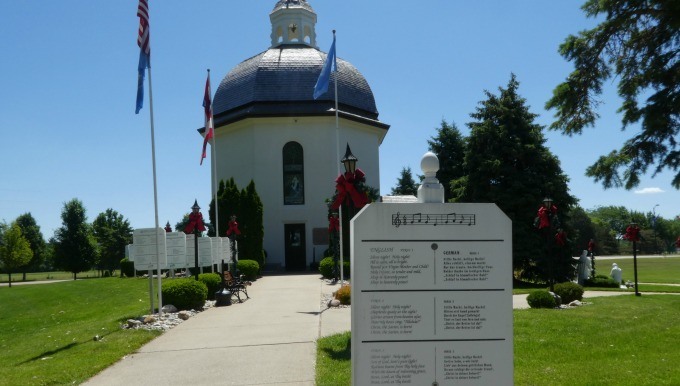 Modeled after the chapel in Austria where Silent Night was sung for the first time, this free attraction boasts plaques with the hymn translated in over 300 languages and the scripture telling of Christ’s birth in over 30 languages. This is an amazing choice for visiting around the holiday season in Frankenmuth, Michigan. Tour the St. Lorenz Lutheran Church and stroll the grounds. 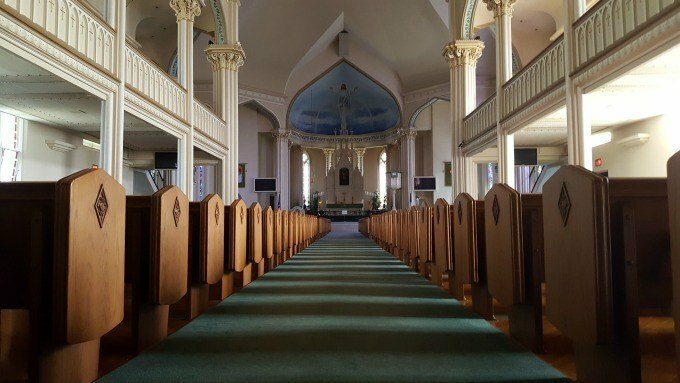 Call in advance to arrange a tour of the stunning sanctuary of the St. Lorenz Lutheran Church to hear the history depicted on its beautiful stain glass windows. On occasion, a church service will be held in German. Go on a Gnome Hunt. This is a fun hunt, but be prepared. You are not looking for one standard gnome. The gnomes come in all shapes and sizes and at least one gnome looks more like an elf than a gnome. Allow plenty of time to find these. Photograph the Frankenmuth Holz Brucke (covered bridge). 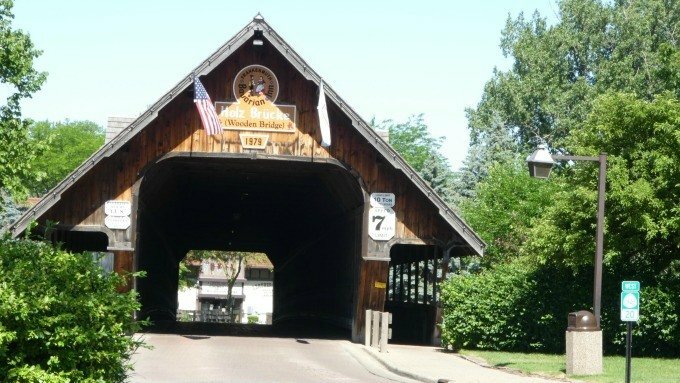 This 239-foot covered bridge spans the Cass River and easily connects you to one side of the river with the Bavarian Inn Lodge to the other side with the Bavarian Inn Restaurant. The bridge is made entirely of wood and was constructed in 1980 by one of the last covered bridge builders. 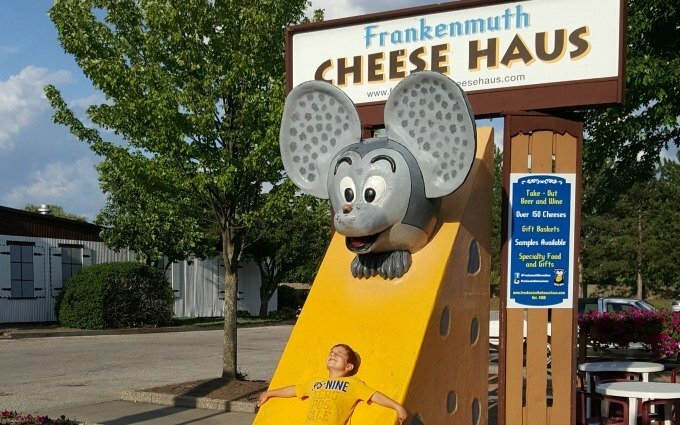 Take a photo with the Cheese Haus Mouse and then sample some cheese. This large roadside attraction and popular photo op location is located right outside the cheese shop that offers many free samples. 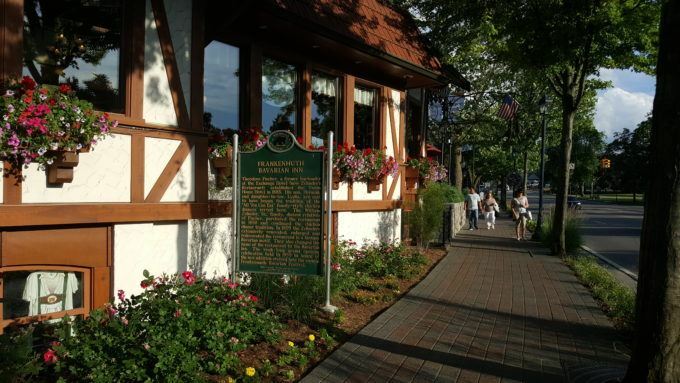 Have you visited any of these attractions in Frankenmuth? 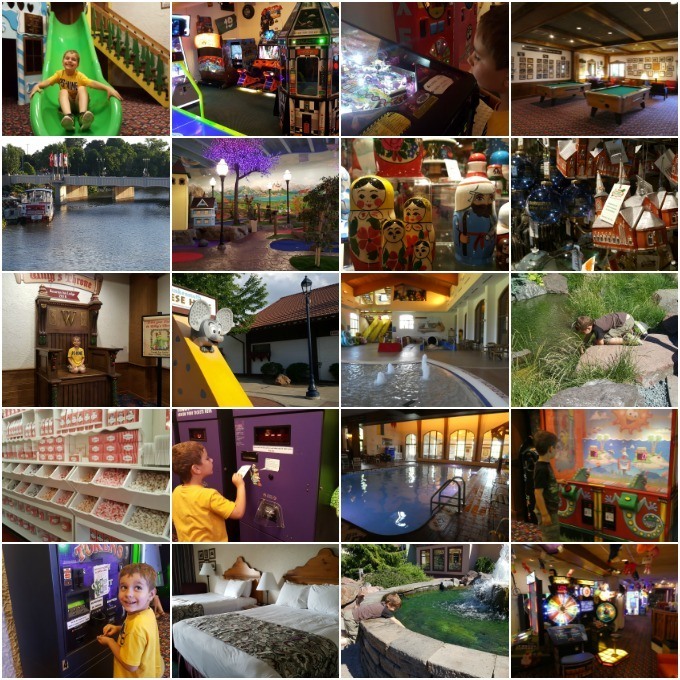 As you plan your next family getaway, look no further than Frankenmuth, Michigan as an ideal vacation destination your entire family will love. Disclosure: I was provided with a complimentary stay at the Bavarian Inn Lodge and meal at the Bavarian Inn Restaurant. 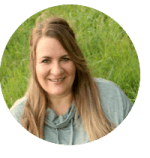 © 2016 – 2018, Tonya Prater. All rights reserved. 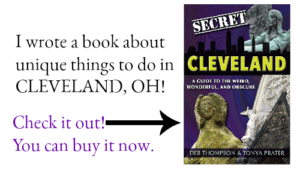 Being from the Detroit area this is our favorite get away destination…….attending the city attracions, restaurants and festivals at least 6 times a year for the past 50 years. We have had dinners with 5 generations of family, our daughters wedding at the Bavarian Inn Lodge with reception following (recommend to all) and adult only get aways over the years. Always feel welcome and like going to a second home! This was great! My Mom and I just were just there in June and it was so good to see it all again! I love the town of Frankenmuth and especially Bronners Christmas Store and the Chapel. Would love to go back there.